I love white, but I never seem to wear it myself. I would probably spill something on it the minute I put it on. Literally just discovered Monki today and fell in love with it. Really like the dress and the outfit. Monochrome chic! The dress is so pretty! I bet it will look really good in the summer! I WANT those black tied bracelets! so cute. Love the outfit! I absolutely love that cardigan, I want one too! 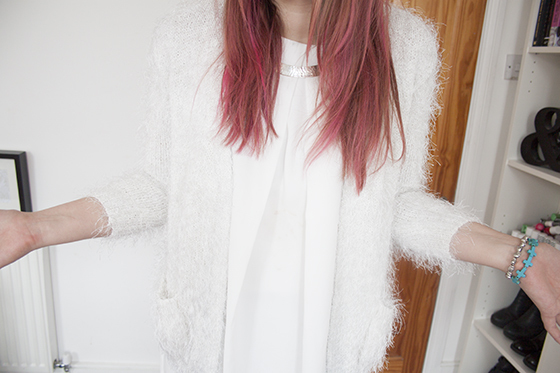 Love the jacket - & your new pink ombre :) Wish I could get away with this look! Look at your hair, it looks just fabulous Lily :) and you rock it effortlessly. I really like your nails too, perfect nail art and they look so neat. 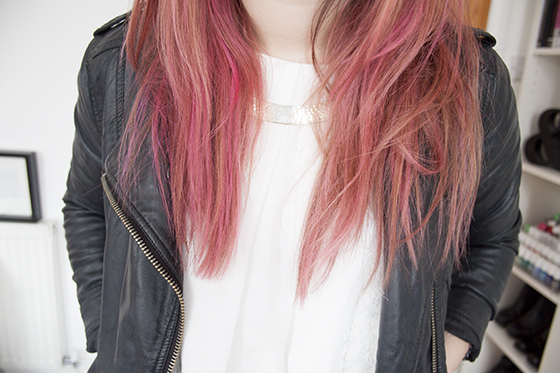 The pink hair is amazing on you! I love your new pink hair, especially with this headband! Your hair makes you look so cool and hipster haha! 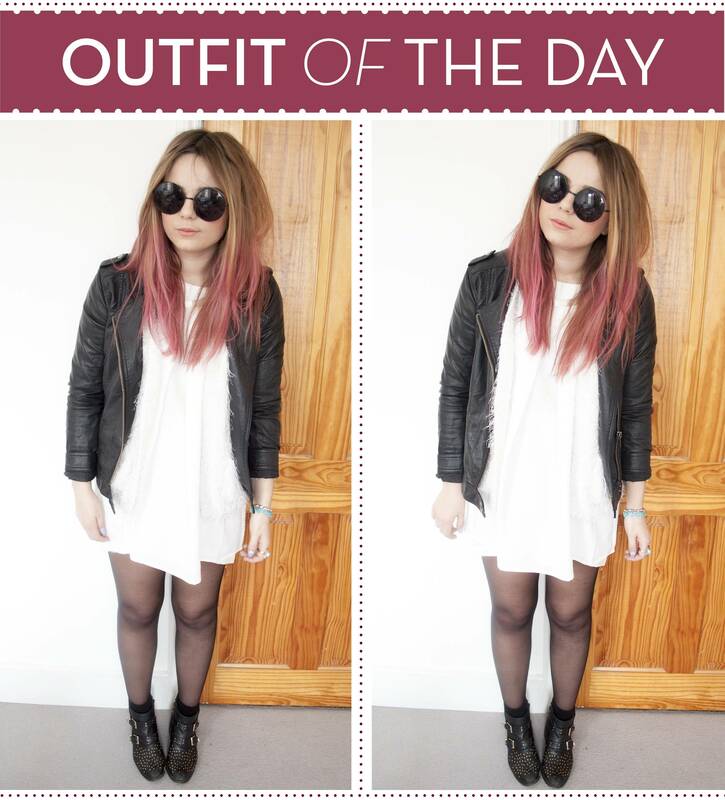 White is indeed very risky, but the combo of the dress with the leather jacket is perfect! Pink suits you amazingly well! Love the dress and the headband! white dress and leather combo's never fail! I really like the outfit!! Your hair looks perfect with everything! ahhh obsessed with your hair! You seriously look amazing here (as always)! Dang girl how do you carry off hair like that and still look beautiful! Love the outfit! Love the new pink ombre! I really like that dress, I've been daydreaming of white dresses and vests recently but I know I'd just ruin them. White dresses are my favourite! I'm loving your hair!! Wow this outfit is SO COOL, reallly love it. Hope you enjoyed your evening..
you look great!! I love what you're wearing, and your nails look so cool!! Your pink ombre looks miiiint! your hair looks so amazing! and i love this outfit! Love your new hair, it really suits you! oooh the hair and fluffy cardi are awesome! The pink really suits you and gives such an edge to your outfit, Love it! 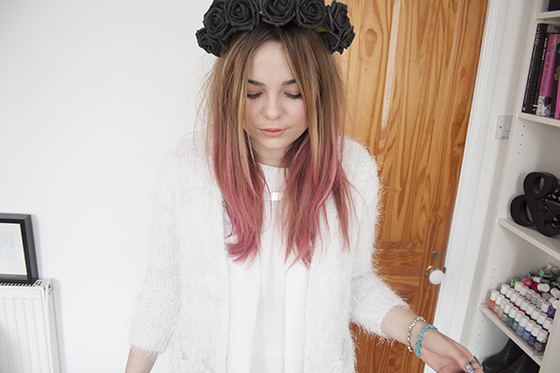 Love the pink in your hair adding some more colour to your outfit, you really suit it! Love Monki! 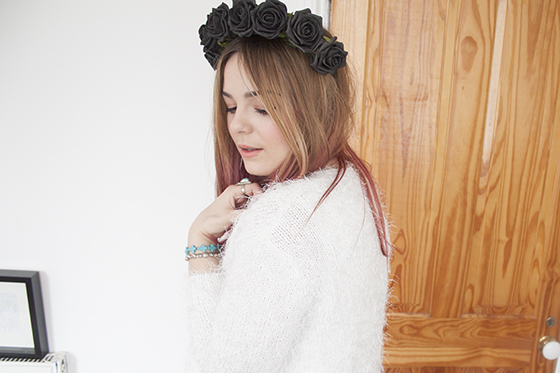 Flower headband looks fab!